With numerous popular locations spread across Osaka and Tokyo, Jan Jan Kushikatsu’s first location outside of Japan resides in Wan Chai. The concept aims to provide a fun and casual dining experience complete with deep-fried skewers, finger food and casual beverages. The square dining space is equipped with an L-shaped bar with wooden stools set alongside the semi-open kitchen. The tatami-lined semi-private dining room is set on the other side of the floor. Though the stools set along the windows are better ventilated, guests have a better view of the chefs in action at the kitchen bar seats. There are no particular order or standard course flow when ordering at Jan Jan. Guests are encouraged to mark on an order sheet as they desire. We recommend starting with wasabi yam slices and tomato. The yam slices, served chilled with wasabi, are creamy and soft, while the raw tomato served with sea salt packs umami with just a touch of juicy sweetness. Jan Jan is all about the fried skewers, as they are served piping hot and mostly involve a light batter, followed by a breadcrumb coating and deep frying in hot oil. We recommend skewers that yield the best textures. Among the meats, pick chicken (leg or shiso maki) over beef and pork, as poultry yield a juicier filling underneath the thin coating. Skewered prawn is firm but great with a light pinch of sansho pepper on the side. Deep-fried half-cooked egg, rice cake, or curry rice are skewers that come highly recommended, and they certainly deserve the credit. The skewers also come grilled, as cubes of beef may vary by texture across orders. The chicken meatball (tsukune) is the best bet, even without its tsukune-accompanying raw egg yolk as a dip. Mains are in high demand at Jan Jan. 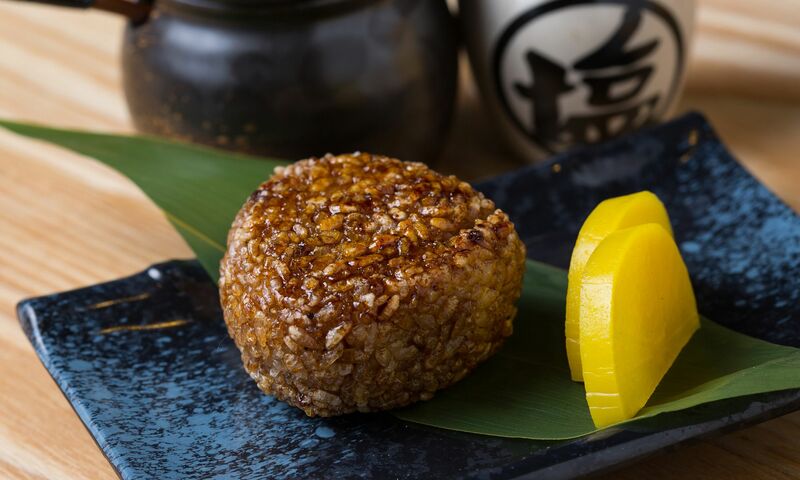 The grilled onigiri, brushed with sweet soy sauce and packed with steamed rice, is crisp on the top side but somehow too soft on the inside. The sobameshi, however, was a surprise hit. The fried noodles and rice were tossed together with a tangy okonomiyaki sauce and topped with shreds of pickled ginger and fresh cabbage, yielding a curiously satisfying treat. The dashimaki tamago, or omelette made with dashi stock, is creamy and soft but a tad too wet. The crispy chicken wings, however, are crisp and tender throughout. Treats such as the castella cake and yuzu sherbet are available in the dessert section, but a more satisfying choice is the deep-fried ice cream sponge cake. A thin layer of cake — fried golden in hot oil — encases a scoop of chilled vanilla ice cream, making for a sweet finish to a full meal. This casual Japanese eatery serves a wide collection of alcoholic beverages that includes beers and umeshus (Japanese plum wines). The Chu Hai Lemon, a traditional lemon-flavoured cocktail, is iced and mildly citrusy to accompany the rich selection of fried fruits from the main menu. Guests can also find a handful of whiskies and sakes served by the bottle, while by-the-glass option is very limited. Greetings and smiles are in abundance at Jan Jan: courteous interjections of hellos and goodbyes were accompanied with deep bows. The staff at the Japanese restaurant is well-trained to make sound dining suggestions, as well as sensible beverage choices to match the orders. Servers are patient, particularly when explaining the set up of the table and walking guests over the seasonings available for maximising the kushikatsu experience. A dinner for two with one beverage each amounts to just short of HK$800. The dishes are mostly executed well, and the experience affordable and authentic to its Japanese origins. Reservations are recommended during peak hours for dinner.